Size&Material: Set includes 2 panels of 52" wide x 84" length blackout curtains. Curtains are made by 100% Grade A fabric,very soft and environmental. Functions: 100% Blackout curtains could keep out the sunlight and harmful UV rays with the help of the innovative triple weave technology. 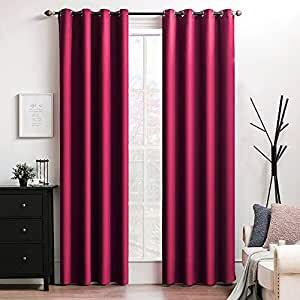 Blackout thermal insulated curtains also could reduce noise and keep heat down at summers or keep cold out at winters.,meanwhile provide privacy. Fine details: Interior diameter of grommet hole is 1.6 inch. Sewn well at each edge of the curtain. Washing Tips: Machine washable in cold water, then tumble dry. Quick ironing or steam clean at low if needed. MIULEE 100% SATISFACTION WARRANTY: Each Balckout curtain panel we made delivers premium quality and amazing workmanship. Plus, you get friendly customer service and Miulee 90-Days No Questions Asked Warranty. Ordered brown shear curtains, arrived yesterday. The curtains are fine. I wish the rod grommets were a darker color, they are shinny silver. When ordered, didn't realize the curtains were being shipped from China. Ordered January 31st and they arrived yesterday, March 12th. I am sure if I had looked a bit harder, I could have found a suitable match with a delivery time of about a week. I'm just happy don't have to return them after waiting soooo long for them to arrive. The curtains are nice enough but tried to return as it was too much purple in the room. The company just suggested I keep and give as a gift. No response on how to return them. This company is out of China. 3.0 out of 5 starsSHEER AF. They are VERY sheer. During the day when the light is shining through the windows, they don’t do much but towards the evening they look cute because you can’t tell how sheer they are. Would work well with a plain white curtain behind. 5.0 out of 5 starsLove these ! Just what I wanted for my bedroom redo. They are a soft baby pink, and so pretty !! I love the silver grommets, as silver is the metal through out my home. These sheers are perfect !